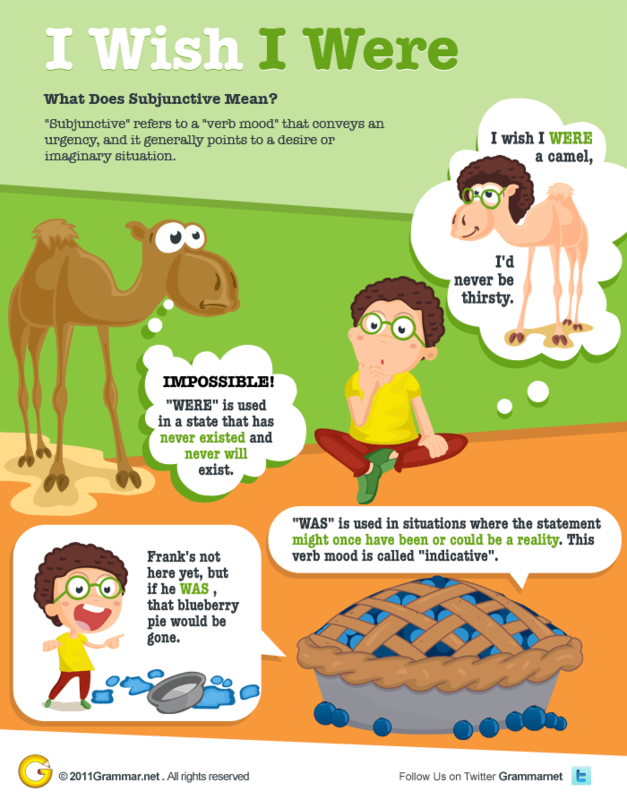 A super interesting one today, about subjunctives. The question is simple: I wish I were or I wish I was – which one of them is correct usage? Answer: Both. Each has to be used in its specific context. “Subjunctive” refers to a “verb mood” that conveys an urgency, and it generally points to a desire or imaginary situation. This mood is most noticeable in the third person. In subjunctive form, the simplest root of the word is used. These sentences illustrate an urgency, and the latter goes further with a prompt–please remove that fox so those poor chickens will not be eaten. Now, coming back to the original question– Both forms, “I wish I were” and “I wish I was” are used to express a desire. However, “I wish I were” is used to express an impossible wish, while “I wish I was” depicts a scenario that can become possible. Source: I wish I were . . . from Grammar.net.